Weston shows you her method and then offers recipes for 56 irresistible flavours, from classic vanilla, chocolate, and strawberry to mango, coconut, key lime, chai, honey, ginger and cardamom, white chocolate raspberry, dulce de leche, avocado, maple bacon, and mint julep. She even offers festive flavours for the holidays, including candy cane, spiced pumpkin, cranberry, eggnog, and gingerbread. Enjoy the tangy creaminess of frozen yogurt at home using a few simple ingredients and your ice cream maker. Nicole Weston, a successful recipe developer and food writer behind the long-standing popular blog Baking Bites, has perfected the techniques you need to know. Nicole's innovative meringue method incorporates air (important for achieving a pleasing texture) and just the right amount of sweetener (melted into the meringue) to produce frozen delights as smooth and satisfying as your favorite commercial flavors. "Most recipes produce hard frozen yogurt, but with this unique technique, using simple meringue and an ice cream maker, the result is creamy smooth and delicious." "Weston's instructions are clear and her recipes are easy to prepare. Practical and inexpensive, this compact cookbook will make a great gift for new ice cream machine owners and frozen dessert lovers." 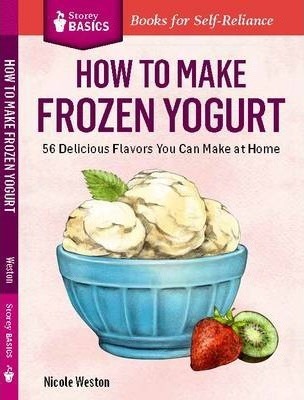 Nicole Weston, a Los Angeles-based pastry chef, chocolatier, food writer, and recipe developer, is the author of Perfectly Creamy Frozen Yogurt, How to Make Ice Cream, and Making Vegan Frozen Treats. Her blog, Baking Bites, was named one of the 50 best food blogs in the world by the London Times and has been featured in many other publications.